Question: What are your personal favorites for your little one? As the owner of a cloth diaper business, I get asked a lot what my personal favorites are. Now, mind you, I firmly believe that what works for one person may not work for someone else, and there are plenty of people out there who swear by diapers that we didn’t have success with, for whatever reason. I have tried a lot of diapers, though, so I am speaking with some experience. Off the top of my head, I know I’ve tried every make of Thirsties; BumGenius AIOs, organic AIOs, 3.0s; Rumparooz; Evolution; GroBaby; Tiny Tush one-size fitteds and pockets; Fishnoodles; Blueberry; Mommy’s Touch; Bummis wraps; as well as every diaper carried in my own store (and I’m sure I’m forgetting a few). I do make a commitment to myself and to my customers that I won’t carry any diapers that I can’t stand behind and so I do think there is something worthwhile in all the brands I carry, but I do have my favorites. These favorites have definitely transitioned as I’ve tried a lot of diapers, and as Grace has grown. 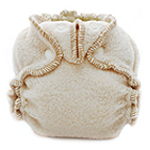 For newborn diapering, I was fortunate to score a huge lot of used Kissaluvs 0 fitteds on diaperswappers and these remain my favorites. While prefolds are also an affordable, smart option for newborn diapering, it is a lovely luxury to not have to hassle with folding or snappi-ing the diapers (and I wasn’t always so great at getting a tight fit with prefolds around the legs, and with runny newborn poop that’s sort of a bummer). I used a combination of Bummis Super Whisper Wraps and Thirsties XS covers over the Kissaluvs and prefolds. I proceeded to try nearly every one-size diaper on the market, and to be honest, the luster of the one-size diaper soon faded. I do understand the economic appeal of a one-size diaper, but unfortunately I find that they just do not fit as well as sized diapers. I have tried to stock what I found to be some of the more adjustable and good-fitting one-size diapers in the store, but for me, I tend to find myself drawn toward at least a two-size diaper instead. alternate overnight: a Thirsties duo diaper with a doubler. I’m not even sure we’d need the doubler, but I haven’t wanted to chance it without. The Thirsties duo diaper comes with a fabulous double-layered hemp & microfiber insert, and it’s so absorbent. A great option for heavy wetters in my opinion. overnight for smaller babies: before Grace hit about 11 months, we were able to use just a fitted diaper with doubler and a Thirsties cover. But at about 22 pounds, she started overflowing with that and leaking. Still, I think the combo is very workable for smaller babies. diaper bag favorites: AppleCheeks. 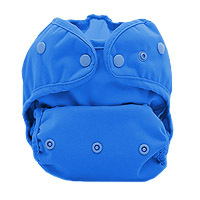 I really love the AppleCheeks and SoftBums for the diaper bag because both can be used as an AI2 diaper. This means you can reuse the shell until soiled, changing only the inserts at each diaper change. This saves room in the diaper bag. 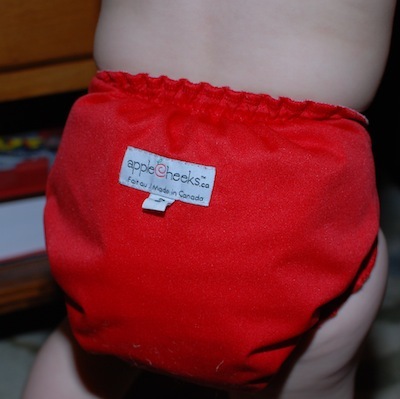 AppleCheeks are my particular diaper bag favorite, because you can also use them as a pocket diaper… so if you are leaving the baby with grandma for a couple hours you can prestuff them to avoid any confusion. at-home use: Thirsties fab fitteds with a Thirsties cover. I ended up quite a few of these purchased affordably on diaperswappers, and I still remain quite happy with them. A great leakproof, easy solution. If I were to choose only ONE style of diaper to use all the time, I would have to say my choice would be either a Thirsties duo diaper or the AppleCheeks system. Why? First, because both have the flexibility to be used as an overnight diaper, just by adding an extra insert or doubler. Second, they are both easy diapers to use, and neither requires the unstuffing of pockets (a task I personally detest). And third, as two-size diapers, they’re a happy medium between the one-size diaper or using 100% sized diapers. Why you want this prize: Kissaluvs Marvels pair adorable outer fabrics with super-soft bamboo inners to create a great one-size fitted diaper. Read more here. Details: winner will be chosen using a random number generator. Deadline for last “comment” is Friday, January 29, at 9 p.m. PST. Winner to be posted Saturday, January 30, and has 72 hours to claim prize. If no response, a new winner will be selected and announced next Saturday. Leave a comment telling everyone what is the one item or brand you would most like Mothering Grace to carry (that we don’t already carry)? You must answer this question for any subsequent entries to be counted. Exciting addition to our store! Mothering Grace is excited to announce the addition of selected Kissaluvs products to our store! The UPS truck just arrived and dropped off our first shipment of Kissaluv 0 newborn fitteds, Marvels one-size fitted diapers, and Marvels one-size covers! We have limited stocking of the Marvels items as we await customer feedback, so if you want to try them, order now! 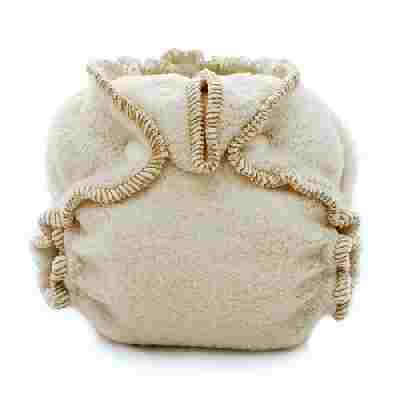 Kissaluvs products are top-notch, made in the USA, and constructed from the finest materials and fabrics. We don’t think you’ll be disappointed! Question: What kind & how many newborn diapers should I buy? The question of what kind and how many newborn diapers comes up a lot, and it’s hard to say exactly what the right answer is for you and your baby. Many people now opt for a “one-size” diaper as their primary system, thinking this will result in a lot of money savings. Unfortunately, except for the SoftBums diapers that we carry at Mothering Grace, I really haven’t seen a one-size diaper that will truly fit a newborn. In fact, most one-size diapers will be sort of ridiculously big on your little one until they hit 12 or 13 lbs. This may be only 6 weeks or so if you have larger babies, but for others it could mean 3-4 months of oversized fluffiness. This leaves most people wondering what the “perfect” diaper is to start off their diapering journey, and this is where it gets complicated. For economics, I think prefold diapers are definitely the way to go for this brief period of diapering. These diapers won’t be getting a ton of use, so it makes sense to go with the cheapest method possible. 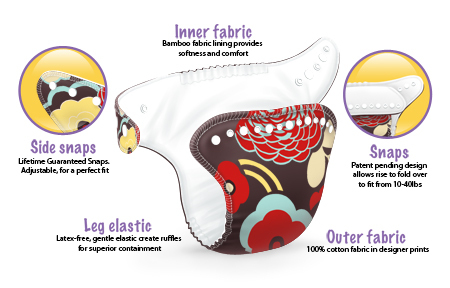 However, when one of the big selling points of modern cloth diapers is that they’re just as easy as disposables, it’s hard to tell people, “Oh, but you really should start with prefolds to save money.” And realistically too, if people get a “bad taste in their mouth” with cloth diapering, then they aren’t as apt to stick with it. This discussion wouldn’t be complete though without offering another option: the two-size diaper (like AppleCheeks or Thirsties Duo Diapers). These diaper makers work from the idea that, if one-size diapers aren’t “really” one-size fits all and you need to buy a newborn diaper anyway, why not just make a two-size diaper? So AppleCheeks and Thirsties have both stepped in and done just that. Both will fit newborns from about 7 lbs. up until around 17, and then at that point you would bump up to the size 2 diapers, which fit until about 35-40 lbs. I think these are a great option for the parent that wants to start with a convenient diaper, and the great thing about these is that they do get a bit more of a customized fit at all sizes than you usually get with a one-size diaper. Both of these are fantastic diapers, so I encourage everyone to really check them out instead of breezing straight past them to the one-size diapers. As for how many, I think to be safe with newborns you need at least 20, even if you are okay with laundering once everyday. Sometimes newborns will be pooping practically right as you’re changing a diaper, and you don’t want to be stuck with not enough diapers. So while older babies can get away with just 12 diapers per day of laundering, I like to have a few extra for newborns.